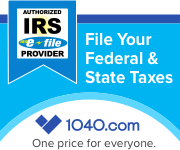 Welcome to the website of April’s Tax Service, Inc. in Saint Charles, MO. The company is owned and operated by April Mertens. Services include tax preparation, bookkeeping, payroll services, and more. Everything you need to know can be found on the website from information, to checklists, to pricing. Please browse. Are you an owner/operator looking to simplify your record keeping and taxes? Click on the truck to find out more! Upload your file securely here. If you don’t yet have an account for file uploads, securely send April your first and last name, email address, and a 4-digit PIN to receive access. Click on the picture or go to “My Taxes” at the top to find a link. Check out the latest changes and updates to my products and services. Click the light bulb or use the link on the right any time. You can file your own taxes online through me for less than it costs to purchase tax preparation software and pay for e-file. You can view info on my pricing page. Click on the blue banner or use the link on the right any time. You can check the status of your refunds for Federal and states on my refund status page. Click on the picture to the left or use the link on the right any time. Visit my Tax Resource Center for tax calculators, FAQ’s, downloads, important dates and information, etc. Click on the books or use the link at the top of the page. Are you ready to have your taxes prepared? Read about my Tax Preparation services and download valuable checklists to help you get ready! Click on the calculator or visit the various pages available from the “Tax Preparation” menu at the top. You can also go straight to checklists on the right side of your screen at any time. Visit my Blog to read about Tax News and/or Tax Law Changes. Click the newspaper to the left or click on “April’s Blog” in the top menu. Did you know that April’s Tax Service, Inc. offers several other financial services to help meet your personal and business needs? Please take a moment to read more about my Other Services. Click on the shirt to the left or visit the links available from the top menu.